We didn’t have to pretend it was the weekend (like the song says) when I made these pancakes. It was a weekend morning and we were in no rush to get the day started. James requested pancakes and eggs so I made these deliciously fluffy banana pancakes, in my pajamas, of course. They are great smeared with jam or maple syrup; they’re even good just plain. Here’s a toast from my breakfast table to yours (sound of orange juice glasses and coffee mugs clinking)! 1. In a large bowl, combine the flours, sugar, baking powder and salt. 2. Combine the egg, milk, yogurt, bananas and vanilla in a separate bowl; stir into dry ingredients just until combined. 3. Pour 1 teaspoon of vegetable oil in pan and using a paper towel spread oil evenly across the skillet. Heat skillet over medium heat. Add drops of oil as needed between batches. 4. Pour batter by 1/4 cupfuls onto hot skillet. 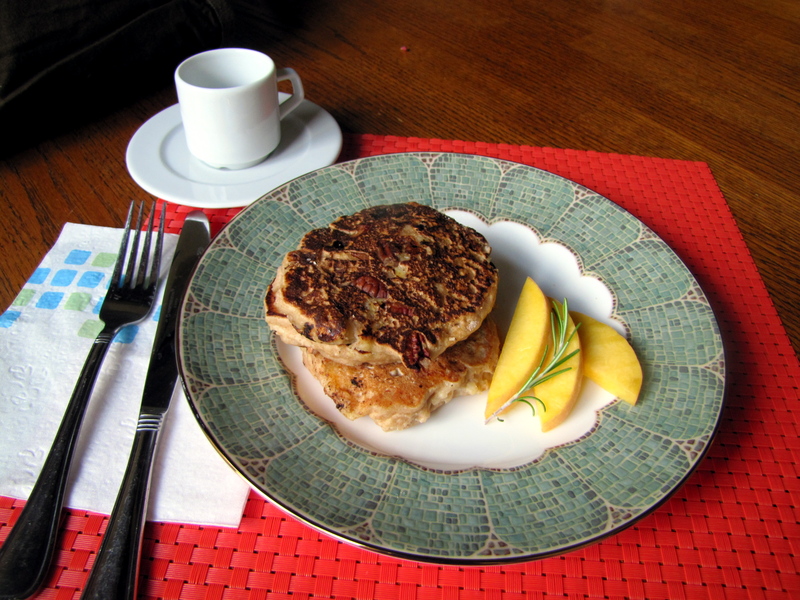 Sprinkle one side with a few pecans or walnuts per pancake, if using. Turn when bubbles form on top, 2-3 minutes per side; cook until second side is golden brown. 5. As pancakes are ready, place them on oven-safe plate and keep them warm in preheated oven until ready to serve.